Is Historic Designation Right for Burleith? Cooley Brothers houses were built during the 1930s and are found on several blocks of Burleith. Photo by Alex Frederick. This is an updated version of our May 6 website post about exploring historic designation. To learn more, please attend the town hall meeting on Thursday, June 16, 7–8:30 pm, at the S&R Foundation Studios at 1801 35th Street NW (former Fillmore/Corcoran School). Doors open at 6:30 for refreshments and a bit of Burleith history. Read the flyer for more details. What? Historic district designation protects and enhances properties significant to the District of Columbia’s historic, cultural, and aesthetic heritage. The designation is made by the DC Historic Preservation Review Board if a district meets one or more of these criteria and the community supports the designation. 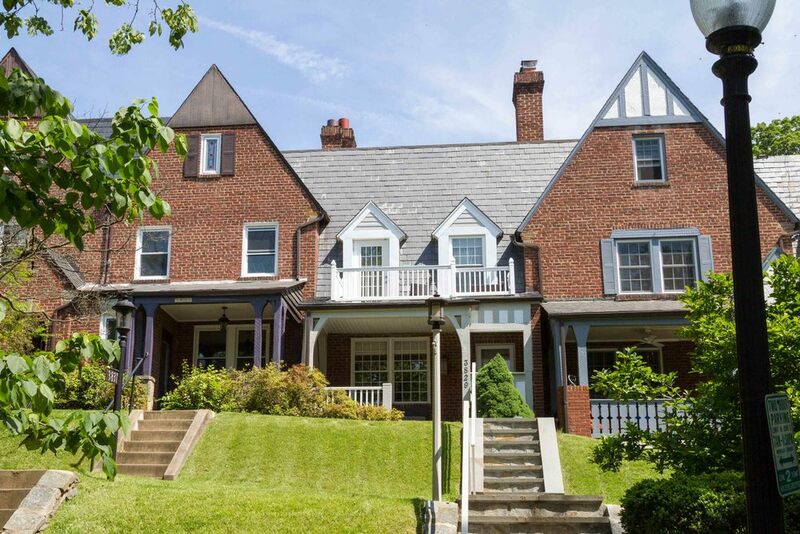 More than 30 DC residential and commercial neighborhoods, including Foxhall Village, Georgetown, Foggy Bottom, Woodley Park, Cleveland Park, Mount Pleasant, and Capitol Hill, have already obtained historic status. Burleith, built primarily in the 1920s–1940s with a distinctive row house style and look, may be a candidate for historic designation. Why? As we all know, Burleith is a special rowhouse neighborhood—close to all of the wonderful urban action, yet quiet, green, and residential. We also have a generally cohesive aesthetic with Georgian colonial-style homes, mixed with some Tudor elements. Indeed, the Shannon & Luchs development from the 1920s that largely forms Burleith was an innovation in its time and was copied in other cities. Chaired by Carol Baume and Lenore Rubino, a new committee is exploring the possibility of obtaining historic designation as one way to preserve our unique architectural heritage. Over the next few months, the committee will organize a variety of outreach activities and establish a dedicated webpage to encourage wide community input and address all questions. Please look for emails announcing these efforts. Here is what we already know about historic designations in DC. What would historic designation mean in practice? Historic designation would mainly affect the front exterior and require it to be in keeping with the current neighborhood style. Essentially, anything visible from the street/public area could not be substantially modified. Any kind of interior renovation is permissible, as are rear additions not visible from the street. What about the zoning code? Burleith is an R3 zone. As a matter of right, structures can be as tall as 40 feet and have a maximum lot occupancy of 60% (fully attached and semi-detached, i.e., rowhouses) or 40% (all other structures, i.e., fully detached houses). The rear yard requirement is 20 feet. The vast majority of Burleith properties occupy much less than the allowable maximum. This means that anyone can put up third floors and expand their property considerably. At the present time, this can be done as a matter of right, as long as appropriate permits are obtained. In the past, there have been issues with requests for zoning variances to build taller structures or to occupy more of the property as well as charges of developers “fudging” their permits. Residents’ opinions diverge on the quality of the DC government’s oversight and enforcement of existing laws and regulations. What about a zoning overlay? Some neighborhoods have implemented overlays. However, the new zoning code is discouraging such requests. Would it be like Georgetown where lots of reviews are required for renovations? No. It would be like Foxhall Village and the city’s other historic districts with the exception of Georgetown. Georgetown’s historic designation was established by an Act of Congress in 1950—the Old Georgetown Act—and all additions and alterations are reviewed both by the Historic Preservation Office and the Old Georgetown Board (OGB). Generally, the OGB has more restrictive guidelines than the Historic Preservation Review Board. Burleith would not have this level of oversight. What about the bureaucratic hassle? All exterior architectural alterations and building permits would need to be approved by the DC Historic Preservation Office. Permits are required for most building activity whether a building is historic or not, including roofs, doors, and windows. (In the past, permits were not required for windows, but they are required now as part of the new Energy Code.) The added “hassle” is simply that if a building is in a historic district, the permit (for all alterations, including roofs, doors, and windows) has to be reviewed by the Historic Preservation Office. Ninety-five percent of permits that come through the Permit Center are “over-the-counter” reviews and are approved the same day that the permit is submitted. Each historic district has a liaison at the DC Historic Preservation office and a neighborhood preservation committee. What are the costs? Certain replacement products (e.g., vinyl windows, asphalt shingles instead of original slate) might not be allowed, and some renovation costs might increase. Although short-term costs may be less with certain replacement materials, the long-term costs are generally greater. Good quality windows are more energy efficient and last longer. Also, the city’s new Green Energy Codes require certain quality windows, so the cheapest windows are no longer acceptable even in areas that are not historic districts. We have consistently heard from officials, architects, and homeowners that the historic preservation staff are extremely willing to work with homeowners to find appropriate solutions. Modern materials are often approved. What are the benefits? Research from across the country shows that historic status raises property values by 5–30%. Historic status also acts as a stabilizing factor during property market turmoil. It also sustains the architectural cohesiveness of the neighborhood and mitigates negative impacts on neighbors. How can you get involved and learn more about historic designation? Attend the community town hall meetings on June 16 and in September (date TBD). Stop by the Historic Designation table at the Burleith summer picnic on June 18. Get updates and more information at the Exploring Historic Designation web page and in the Burleith Bell. Join the Burleith listserv (search “BCA Yahoo Groups” to sign up). Email hd@burleith.org with your questions, comments, and concerns. Make a tax-deductible donation to cover outreach and historical research expenses. Become a member of the Burleith Citizens Association.